Vintage restoration happens here ! We have been lucky enough to have been working on these cool old cars at this location since 2004. 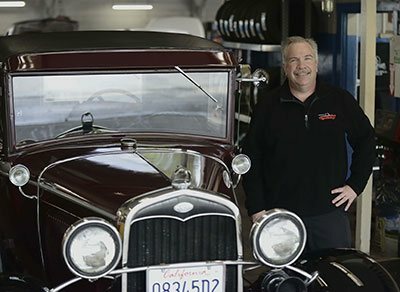 We always had a great reputation as a shop since the 90'S and some of our customers wanted us to work on their vintage vehicles. Since both myself and Greg Sisk are big classic car enthusiasts and we liked the idea of working on classics during the week, not just the weekends. That same year we put on the inaugural Orinda Classic Car Show. We thought it would be cool to let the locals show off their cars and raise some money for local charities. Since then Orinda has been synonymous with classic cars. As our reputation grew we became busier and started to expand. We hired another specialist and re-configured our shop. 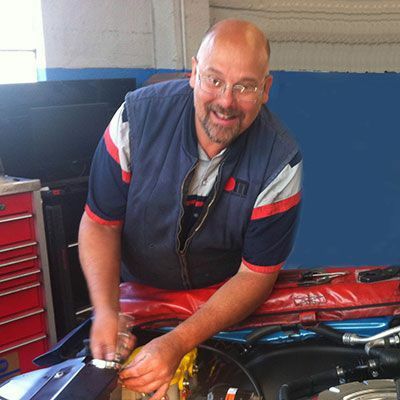 We brought back “Vintage” Vince Poehnelt and we now have two ASE Master Technicians with over thirty years experience each as well as myself and a support staff. We now have enough space in our shop to let a car sit inside while waiting for parts. This configuration allows us too have two veteran classic car techs available to work on these cool cars all day long! That means we make progress on your vehicle as soon as we take it in. This classic car business is not a “spare time” thing for us. We will not push your baby out of the way when we have “regular work”. We have a whole different shop with a different crew to take care of modern cars. Orinda Classic Car Center is dedicated to vintage cars and trucks only. We like to put a personal touch on every job we do. We also use our vast experience to help us gets the results you need. I have been in this business for over thirty years also. This is my dream job. I know what a “fixed car” is and I personally perform quality control on each job that goes out of our shop. With our “classic only” commitment, focus on customer service and workmanship we get results like no others. John grew up around cars his whole life. When he was five years old his brother purchased a 1966 Mustang and he was hooked. He started working at his brother's shop when he was fifteen. He joined his race crew when he was sixteen and became manager at age twenty-six. He worked there until his brother closed the shop in 2004. Being around classic cars his whole career made him want to specialize. When he moved his expertise to Orinda he found a home where he could live out his classic car dream. Greg is a terminal car guy! 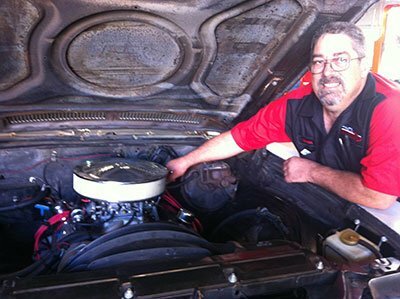 After going to trade school, serving on a pit crew and owning, restoring dozens of cool cars he now gets to live his dream every day. His personal collection is up to about fifteen. He has a rare skill set that includes welding, fabricating, electrical, differentials, carbs and computer controlled hot rods! We could not have the Orinda Classic Car Center without this guy! We are fortunate to have our own Super Girl in our classic car shop. Not only is she a great extra set of hands when you need it she can be very handy at everything else from fixing equipment, prepping engine compartments and running for parts like nobody's business. She loves being around these cars. On any given day can see her running around Orinda in the white SS Wagon. Vince is a breed of tech that they do not make anymore. Most regular repair shops don't have a guy like this. His vast experience on American cars and trucks from the 50's – 70's allows to have success restoring these old vehicles. He has several draws full of rare pieces that he pulls out from time to time. He also has a tackle box full of carb jets so he can get all of his carb jobs dialed in. He also has made several tools to make particular jobs come out just right. Great guy to have on our team!